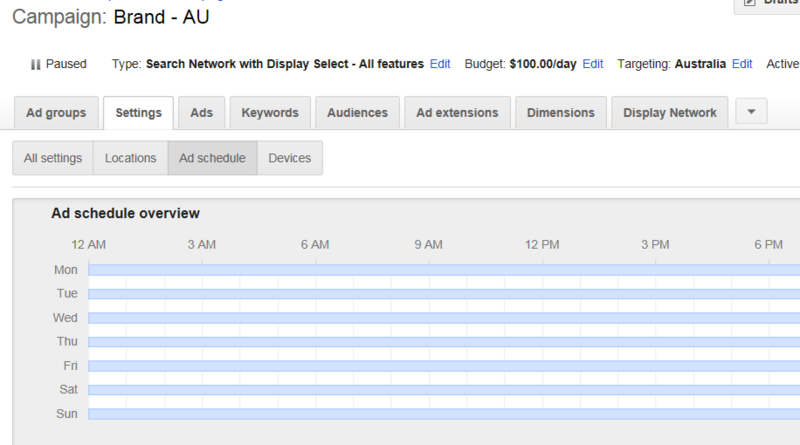 Determining when you should optimize your Adwords ad schedule and spending are a critical part of campaign management. This practice is commonly known as DayParting. There are several ways to determine when you should be maximizing or minimizing bid adjustments. Lets dive into how to discover your most profitable hour of the day and day of the week. More than likely, depending on the nature of the business, this may be apparent. However, clients may not understand lead times and shopping behavior online. So, its best to check your data resources such as Adwords and Analytics. You can do this by following the steps below in Adwords platform. You will see a list of hours of the day as dimension and the metrics that you will need will also be available. Our outcome metric may be conversions or leads. However behavior metrics are also equally important such as CTR. Alternatively, you can also evaluate the “Day of the Week” also to improve spending efficiency across the week. For our purposes lets look at the how to adjust spend for a particular part of the data. It’s is often helpful to download this data into excel and visualize the data using conditional formatting. You can easily see where to concentrate your efforts. We can easily see that an ideal time to optimize our ad scheduling or bidding strategy is between 7:00 and 3pm. Additionally, we have another window of opportunity at 7 to 9pm. Now the question is what can we do with this information. 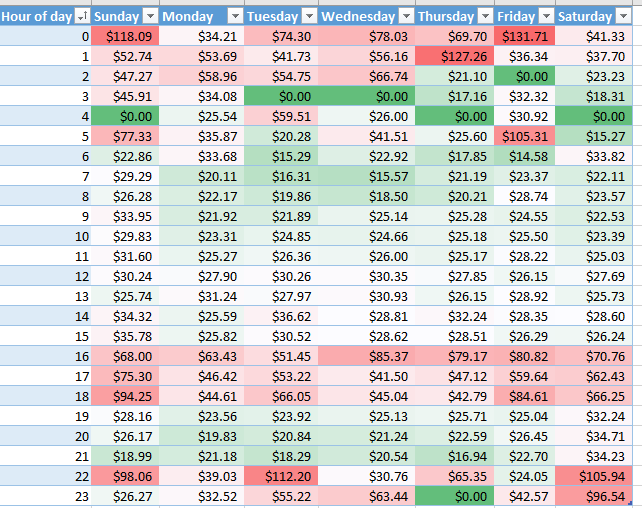 Run ads all day but with bid adjustment for a specific time period. You can do this by pressing the “+AD Schedule” button and modifying the ad schedules and bid adjustments. Be conservative at first and monitor metrics such as CPA and ROI. Also customer lifetime value. Adwords is just showing you a window into the acquisition phase of your business. You may need to dive deeper into lifetime value of your customers. If the numbers meet your objectives, then we can optimize these campaigns purely on conversions LCV. Evaluating CPA across days of the week, will indicated that CPA is relatively flat for this campaign. We see deltas on the off peak hours that was reflected in our hour by day analysis. You should evaluate your CRM data to see if you have repeat purchases and determine whether these deltas are acceptable.